Standard-compliant colour proofing demands standard-compliant lamps. 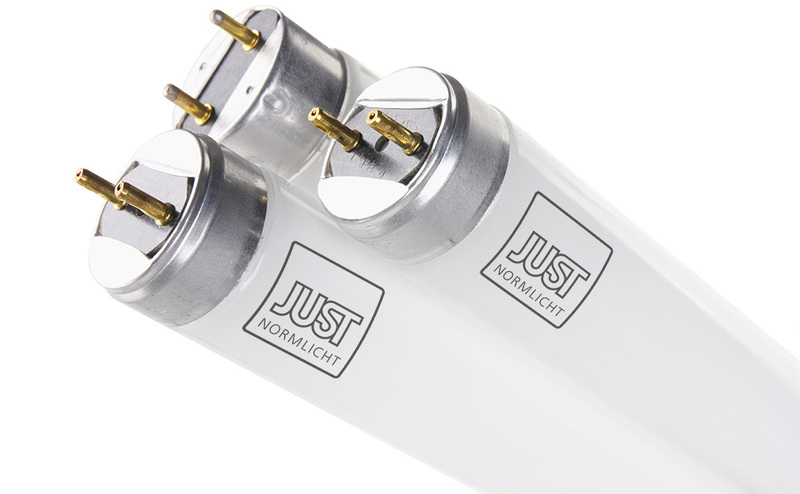 Fluorescent lamps, developed specifically for the graphic arts industry, with CIE D50 standard light source to ISO 3664:2009 and ISO 12647-2:2013. Outstanding colour properties and metamerism indices, far better than the minimum requirements. Reliable colour matching to international standards. The new CIE D65 fluorescent lamps to ISO 3668, ASTM D1729 and DIN 6173-2 achieve top values for colour properties and metamerism indices. For visual colour comparisons in the manufacturing industry. Have your 2,500 operation hours expired? You can find the right fluorescent lamp sets for your JUST device here. Simply select the appropriate set, place an order, and you'll be back to standard-compliant colour matching within a few days.